This quality line is one of most popular. 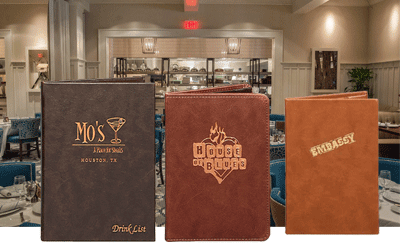 These menu covers are constructed from many rich textured materials. From Faux baby Ostrich to Distressed Faux Leather each of these make a bold presentation. This menu cover is a perfect choice for Steak Houses and Country Clubs. 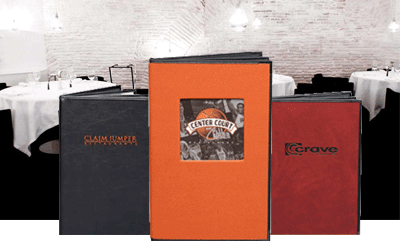 Match your menu covers with wine books, placemats and check presenters for an elegant presentation. Choose your decoration, blind debossing (no color) for a branded look or use a foil color to make the logo pop! Other options are a window with your choice of insert. This line is one of our first hardcover menu covers that just keep’s getting better with age. Made with faux Italian Leather and stitched edge this is an extremely durable cover. French turned edge and stitching completes the look. This menu cover is available with or without padding. We line the interior panels with Morie Silk or leatherette. Decoration is easy, Blind or Foil Stamping to customize with your logo. Nothing says quality like the scent and feel of genuine leather. 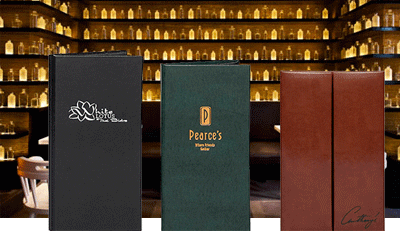 Fine dining establishments seeking the exceptional; turn to us when the finest quality leather menu is desired. Bonded Leather is a man-made material composed of 95% to 100% Real Leather fibers with a latex binder. This has the look and feel of smooth leather, at a fraction of the price. This material is easy to decorate with your logo or custom design. We also offer Genuine Hide Leather in many colors. Call us for details. Give your patrons the Royal treatment with these attractive, yet affordable covers. The Royal Menu cover is available in 2 options: Clear Trimmed Interior Panels or Corner Catches. The material line is exceptionally durable with many colors to choose from. 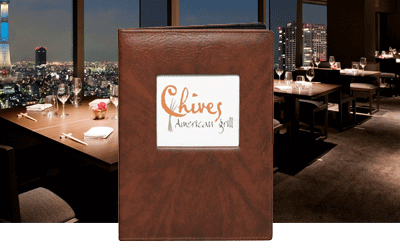 This menu cover has leatherette trim and metal corners to protect the covers from damage. As with all of menu covers the Royal Café is easy to Blind or Foil Stamp. Long lasting and made for that menu with many inserts!